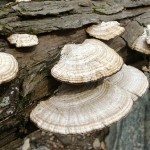 Will plants planted in soil where a tree that died of bracket fungus die also? We have removed a young beech tree that had died of bracket fungus. If I replant the area with perennials, will they die as well? You should not have any trouble replanting the area.